Allowing myself to feel beautiful post baby has been one of the hardest things. In so many ways motherhood has really strengthened me, and allowed me to become more patient, sweeter, nicer, less self-centered (that needed to happen eventually, right), less proud, more humble. 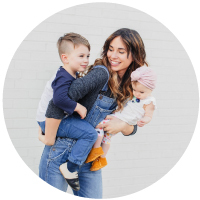 In so many sweet, tender ways, this motherhood thing has been a great empowerment, and has helped me address many of my great flaws (far from perfect here). I think something that I have struggled with for a long time has been feeling self-worth. It is extremely hard to admit, but all too often I would dig so deep into myself that I just didn't like what I found, and I was certain so many felt the same. Of course, there are issues within me that stem back to early childhood, but a lot of my "pain" came from the decisions I was making myself. No one made me choose to do stupid things. A few years back, I started to not like myself and in turn didn't think anyone else could either. I got really good at pushing the people I cared about most away because I didn't think I was good enough for them, and also because I didn't want them to leave me. So instead, I tried to leave first. This caused a very vicious cycle of yo-yoing in and out of unhealthy relationships. Not my finest of moments, but one day I found someone. He felt just as hurt, angry, and sad as me. Together we built each other up, and worked through those feelings. When he pushed I pulled, and we slowly learned to open up and trust each other. We also learned to let go of the fear of heartbreak, and more importantly grew to be great friends. Sometimes bad things have to happen in order for great things to follow, and I will be forever grateful to this angel who came and turned me around. I am far from perfect, and sometimes I don't like who I see in the mirror because I know all my flaws, but on the very best of days I love the mother that I am. I love the wife and woman I have been able to become, and I am grateful every day for the opportunity to keep striving to be better. Far from perfect, I own up to my mistakes. No one made me make the mistakes I have, but I also choose some pretty amazing things along the way. In the first paragraph you talk about how having a little bean has helped you! I have a fear that I won't let myself have children till I think I am as near perfect as I can be. I feel so flawed some days. I think that I need to be more patient, more kind, less crazy.., less self-centered, etc. before I can bring a sweet baby into my life. Did you have these same fears? It is so great to read that these things just become stronger for you afterward. Do tell me more! !